Buddhism traveled to Japan by water, on ships passing through the Inland Sea to the port of Naniwa. From here the visiting priests and artisans, together with Buddhist scriptures, images, and ceremonial implements, traveled up the Yamato River into the Yamato Basin, which you see enlarged here. This moist and fertile plain, about ten miles wide and ringed by low mountains, was the home of the early Japanese state as it took shape in the fifth in sixth centuries. The red circles show the bases of the rival clans that struggled for shares of power in the emerging state. The particularly powerful Soga clan is seen in the Asuka region to the south. 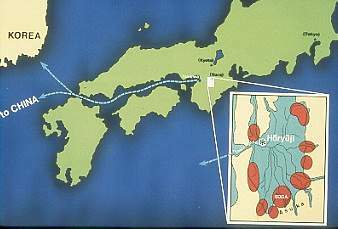 In order to break free of the pattern of endemic warfare in the Yamato Basin, Prince Shôtoku took the radical step of locating his palace not in a military stronghold near the mountains but rather near the center of the basin, closer to the point where the Yamato River flows out to Naniwa. This demonstrates the prince’s policy of relying on the power of continental ideas rather than traditional military power.